Ticketmaster is the number one destination for live event tickets in the UK. From popular theatre, comedy and the best sporting events, to family attractions, top gigs and festivals - Ticketmaster have it all. With new events added on a daily basis you’ll know there’s always a fresh and exciting reason to return time and time again. 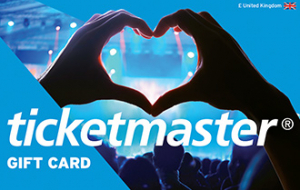 So whether you’re looking for your own spine-tingling encore or a gift that your loved one will never forget, with a Ticketmaster gift card you’ll have access to events that will give you memories to last a lifetime. Visit www.ticketmaster.co.uk to see what fantastic events are currently available. Redeem at www.ticketmaster.co.uk. Please note, you will need both the code and pin code to hand when you book your tickets. To check your e-Gift card balance, go to www.ticketmaster.co.uk or call 0844 847 1640.